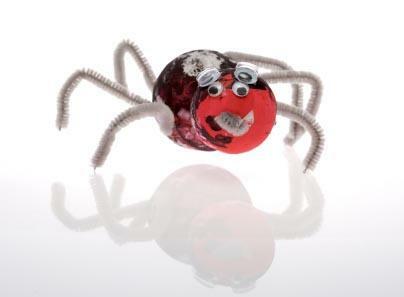 Real spiders can be kind of creepy, but spider crafts are much too cute to scare anyone! These projects are fun to make for Halloween, but they can also be used as learning activities to supplement lessons on children's stories such as The Itsy Bitsy Spider or Charlotte's Web. Kids can complete the crafts mentioned in this article in 20 minutes or less using basic craft supplies. Adult supervision is required, however. Handprint spiders are good crafts for toddlers and preschoolers. Dip the child's hand in black paint, covering everything but the thumb. When the handprint is dry, add google eyes to the spider's face. Cut the spider out of the paper, then add a string for hanging. If you don't want to deal with messy paint, try another idea. Simply trace the child's hand and color in the design using crayons, colored pencils, or markers. Turning an old CD into a cute spider decoration is a fun craft for elementary school children. Trace around the CD to cut out a circular piece of black felt. Glue the felt to the top of the CD. Glue the eyes onto your spider. Use the red fabric paint to give the spider a mouth. Cut four pipe cleaners in half to make legs for your spider. Glue them to the bottom silver side of the CD. When the glue is dry, bend the pipe cleaners up so that they resemble spider legs. If you don't have black felt and fabric paint handy, you can use black construction paper and a red marker to create your spider. A child can make a flat spider by gluing the legs to the side of the body instead of the bottom of the CD. To make a slightly more elaborate body, use two overlapping circles of cardboard instead of the old CD. For an older child, you can create a small CD-shaped book that attaches to the bottom of the spider. Kids can have fun writing a Halloween themed story or their own rendition of a classic like The Itsy Bitsy Spider. Spider puppets are excellent crafts because they encourage storytelling and creative play. This puppet is easy to make and a clever way to recycle an old glove that has lost its mate. Put the glove on the child's hand. Glue the other pom pom just behind the first. The two should be touching slightly. Glue the google eyes on the pom pom nearest the knuckles. To make the puppet crawl around, the child simply needs to wiggle his fingers. Spider crafts are generally very easy to make, but it's important to remember that young children are notorious for their short attention spans. To make sure you have a successful crafting experience, remember to gather all of the necessary supplies and materials before you begin your project.